First edition (finished): The first edition, organized by Télécom ParisTech, was launched during CHES'08 and its results were announced during CHES'09. This edition was an SCA evaluation contest against an implementation of DES on a custom ASIC. Second edition (officially finished but submissions still accepted): The second edition, organized by Télécom ParisTech, was launched in January 2009 and its results were announced during COSADE'11. This edition was also an SCA evaluation contest against an implementation of AES on a FPGA (on SASEBO GII board). Third edition (finished): The third edition, organized by AIST and Télécom ParisTech, was launched during COSADE'11. This edition was an acquisition contest based on the SASEBO GII board. Fourth edition (open): The fourth edition, organized by Télécom ParisTech, was launched in July 2013. 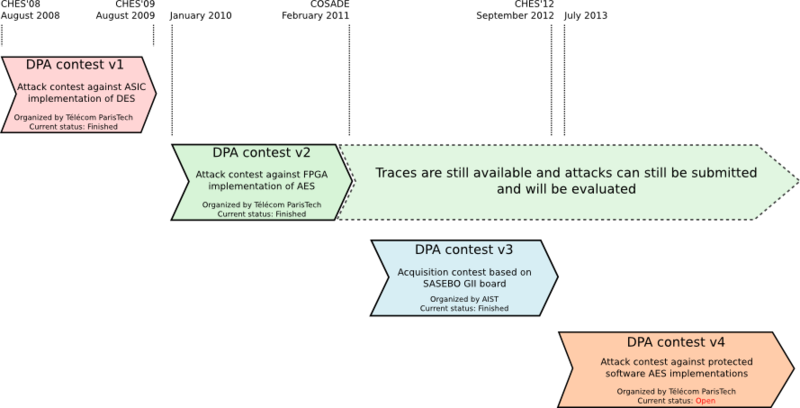 This edition is an SCA evaluation contest against protected software implementations of AES on a smart-card (on SASEBO-W board). Practical improvements of side-channel attacks on AES: feedback from the 2nd DPA contest. Christophe Clavier, Jean-Luc Danger, Guillaume Duc, M. Abdelaziz Elaabid, Benoît Gérard, Sylvain Guilley, Annelie Heuser, Michael Kasper, Yang Li, Victor Lomné, Daisuke Nakatsu, Kazuo Ohta, Kazuo Sakiyama, Laurent Sauvage, Werner Schindler, Marc Stöttinger, Nicolas Veyrat-Charvillon, Matthieu Walle, Antoine Wurcker. Journal of Cryptographic Engineering (JCEN). Volume 4, Issue 4. November 2014. Pages 259-274. DOI 10.1007/s13389-014-0075-9. DPA contests: from V4 to V4.x. Nicolas BRUNEAU, Jean-Luc DANGER, Guillaume DUC, Sylvain GUILLEY, Annelie HEUSER, Zakaria NAJM, Laurent SAUVAGE. Workshop on Cryptographic Hardware and Embedded Systems (CHES), rump session. September 2014. DPA contest v4. Guillaume DUC, Sylvain GUILLEY, Laurent SAUVAGE, Jean-Luc DANGER, Tarik GRABA, Yves MATHIEU and Renaud PACALET. International Workshop on Constructive Side-Channel Analysis and Secure Design (COSADE). April 2014. DPA contests (results of v3). Guillaume DUC, Sylvain GUILLEY, Laurent SAUVAGE, Jean-Luc DANGER, Tarik GRABA, Yves MATHIEU and Renaud PACALET. Workshop on Cryptographic Hardware and Embedded Systems (CHES), rump session. September 2012. DPA contests. Guillaume DUC, Sylvain GUILLEY, Laurent SAUVAGE, Jean-Luc DANGER, Tarik GRABA, Yves MATHIEU and Renaud PACALET. International Workshop on Constructive Side-Channel Analysis and Secure Design (COSADE). May 2012. DPA Contests: v3 Status and v4 Perspectives. Guillaume DUC, Laurent SAUVAGE, Jean-Luc DANGER and Sylvain GUILLEY. Cryptographic Hardware and Embedded Systems (CHES), rump session. September 2011. Education and open benchmarking on side-channel analysis with the DPA contests. Jean-Luc DANGER, Guillaume DUC, Sylvain GUILLEY and Laurent SAUVAGE. Non-Invasive Attack Testing Workshop (NIAT). Septembre 2011. Results of the 2009-2010 "DPA contest v2". Guillaume DUC, Sylvain GUILLEY, Laurent SAUVAGE, Florent FLAMENT, Maxime NASSAR, Nidhal SELMANE, Jean-Luc DANGER, Tarik GRABA, Yves MATHIEU and Renaud PACALET. International Workshop on Constructive Side-Channel Analysis and Secure Design (COSADE). February 2011. Overview of the 2009-2010 "DPA contest v2" (preliminary results of DPA contest v2). Guillaume DUC, Sylvain GUILLEY, Laurent SAUVAGE, Florent FLAMENT, Maxime NASSAR, Nidhal SELMANE, Jean-Luc DANGER, Tarik GRABA, Yves MATHIEU and Renaud PACALET. Workshop on Cryptographic Hardware and Embedded Systems (CHES). August 2010.